ON the 24th December this year, Montreal was a poster child for the “new normal” – mild weather, no snow in sight. All that came to an abrupt end on the 29th, when Montreal strayed off narrative with a record breaking snowfall. No doubt all that snow was due to CO2 causing climate alarmists to make fools of themselves. In those three sentences Eric achieves a lot. He builds a straw man, he implies that there was a narrative to break, and he wrongly thinks that "alarmists" think that with global warming it won't snow in winter in Montreal. You could infer more from those three sentences, such as Eric thinking that if something hasn't happened yet it won't happen as climate change continues. Or you might infer that Eric thinks that a fresh fall of snow negates the especially mild December, makes it all go away. That would be supposition, so I won't dwell on that. Eric starts with a straw man. He just makes stuff up. There is no science that suggests that it is now normal for Montreal to be without snow all winter. I don't know if Montreal has ever had a winter without snow in the instrumental era. I doubt it. It gets very cold up there so winter precipitation is likely to take the form of snow. Last winter, people in Montreal were complaining about it being the coldest winter in 20 years. Logical fallacies are one of the telltale techniques of climate science denial, and building straw men is a favourite pastime of deniers. The record snowfall is only for 29 December. It's just a day record, not a winter time record and not even a December record. Still, the snowfall was heavy for Montreal, measuring 39.2 cm (15.4 in). I looked up the record for December and it was around 45 cm (18 in) on 27 December 2012. This was also the all time record for a day's dump of snow in Montreal. (Some locals recall the snowstorm of March 1971 as more memorable.) I came across a meteorological discussion of the December 2012 weather event - from Sheldon J. Kusselson (NOAA NESDIS), and another from Lee Grenci at Wunderground.com. 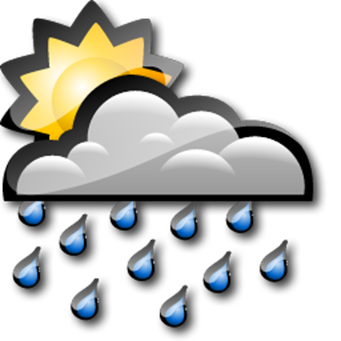 Precipitation: With global warming there is more moisture in the air. That means that there are more heavier downpours and snowfalls than when the planet was cooler. Temperature: With global warming the average temperature over the entire planet is higher than it was. That doesn't mean the end of the seasons. It doesn't mean that winter will stop. It doesn't even mean that every single place on earth is warming. There are some places that have been cooler. Not many, but a few, as you can see in the trend map below. The month of December is characterized by rapidly falling daily high temperatures, with daily highs decreasing from 0°C to -5°C over the course of the month, exceeding 6°C or dropping below -14°C only one day in ten. This month it was 16 °C on Christmas Eve, after days of warmer than normal temperatures. Eric quoted from an article on CBC News, which stated that the Christmas Eve temperature was " a coat-shedding 20 degrees higher than normal for this time of year." That's 20 °C higher, or 36 °F higher! Reading through the CBCNews article it quoted the World Meteorological Organisation as attributing the record-breaking warmth to El Nino (16 to 20 per cent) and global warming. I expect some can be attributed just to weather variability, but not much. It looks as if Environment Canada houses someone who wants to play down the influence of global warming. The article quoted Environment Canada meteorologist Simon Leblanc: ""We can't say 100 per cent that it's climate change," he said. Between the two, he said El Niño is more likely to blame than climate change." Thing is, if it was just El Niño then it's unlikely that the temperature would have got that high. It hasn't before (as evidenced by the record). 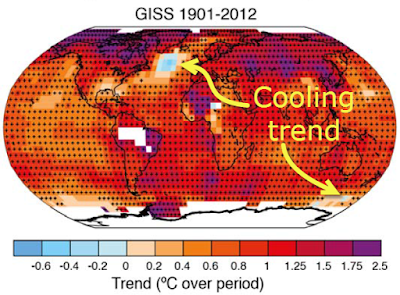 I'm more inclined to the WMO view - that it's both El Niño and global warming. Remember how Eric wrote, flippantly: "No doubt all that snow was due to CO2 causing climate alarmists to make fools of themselves."? I don't know what he could have meant by that. Is he arguing that it didn't hit 16 °C on Christmas Eve in Montreal? Is he arguing that snow in winter in Montreal means climate science is a hoax? More fool Eric. Eric has been haunting climate blogs for years. He's not got the excuse that he's ignorant because he can't bring himself to visit decent climate blogs. He pestered people at WatchingTheDeniers for quite a long time (where he made a habit of equating climate science with early 20th century eugenics). Back to Eric. You'd think that some science would have rubbed off, but it didn't. That's why I speculated up top that he is not interested in climate science. The driver is more likely wanting to appear smarter than he is. (A bit like Anthony Watts.) Eric has more chance of doing that at WUWT than on a climate science blog, but even at WUWT his efforts have mixed results. His article was about a piece by Iftikhar Firdous in the Express Tribune (with the International New York Times). It was about how the provincial government doesn't seem to have a strategy to deal with the weather that climate change is bringing, particularly when global warming exacerbates El Nino, bringing more snow and rain. Floods triggered by the glacial lake outburst phenomena (GLOF) phenomenon have killed more than 90 people across Malakand Division. And yet, there are a series of doubts as to what has caused these events. Here I was thinking that the Himalayas were melting away. Luckily journalists on the scene have corrected this misapprehension, and helped us to understand that global warming causes harsher winters and a massive increase in snow accumulation. The glaciers in the Himalayas are melting. Eric is wrong if he really thinks that glaciers aren't retreating in the Himalayas. Many and maybe most of them are shrinking. There is a human interest article about villages in the Himalayas that have been affected by reducing glaciers, written by Daniel Grossman on the Yale Environment 360 website. Recent climate changes have had a significant impact on the high-mountain glacial environment. Rapid melting of glaciers has resulted in the formation and expansion of moraine-dammed lakes, creating a potential danger from glacial lake outburst floods (GLOFs). Most lakes have formed during the second half of the 20th century. Glaciers in the Mount Everest (Sagamartha) region, Nepal, are retreating at an average rate of 10–59 m a–1. From 1976 to 2000, Lumding and Imja Glaciers retreated 42 and 34 m a–1, respectively, a rate that increased to 74 m a–1 for both glaciers from 2000 to 2007. During the past decade, Himalayan glaciers have generally been shrinking and retreating faster while moraine-dammed lakes have been proliferating. Although the number of lakes above 3500 m a.s.l. has decreased, the overall area of moraine-dammed lakes is increasing. Understanding the behaviour of glaciers and glacial lakes is a vital aspect of GLOF disaster management. The point I wanted to make is that using the Tribune article to reject climate science is a low blow even for deniers. Eric is mocking people who are most vulnerable to climate change, who are suffering from the more extreme weather and risks to their water supplies, all brought about by global warming. The blizzard that hit western Texas, Oklahoma and New Mexico, extending to Kansas, Wisconsin and Michigan. And that's not including all the extreme weather happening elsewhere in the world. You'd think that odd for the blog of an ex-weather announcer who dubiously boasts of owning the "the world's most viewed climate website", except that it's not a climate website. It's not a weather website either. It's a conspiracy blog for dismal deniers. This is a mixture of thoughts from both the Montreal article and the Pakistan article. Not that it matters. I'd guess that most of the people commenting at WUWT don't bother with the articles they are supposed to be commenting on. They just see the box that invites them to post whatever silly thought is in their head at the time - and away they go. I think Leo Smith is having trouble understanding that all weather is impacted by the greater amount of energy on Earth, and by the warmer atmosphere, more moisture, and warmer oceans. That is, climate change affects the weather - yes, really! Well here they are back on message telling us that the warm winter is down to ‘climate change’. Anything that happens is down to climate change, innit? AndyG55 doesn't know that global warming causes climate change. Not only that, but he's an ice age comether. Its was called Anthropogenic Global WARMING for a reason. They changed it to Climate Change.. because warming stopped. This is what passes for a thoughtful, sensible comment from Janice Moore. It contains verbs and nouns. There’s the take-away from that bit of journalistic farce. What else can one do? Bill McK. and the Climate Clowns — does any rational person take them seriously? waaaaaay a minute….lolollo — NO I am not W.U.I…. just hasty. Heh! lee_jack01 is waiting for a story. Just waiting for the story that this abrupt change is just another example of extreme weather events caused by humans adding CO2 into the system…….I can almost guess which news outlets will run with it. I wonder if it occurred to anyone here that blogging about a late December snowfall *in Montreal* speaks volumes about just how unusual the autumn weather had been up to that point. Latitude only gets away with pointing out the obvious because he's known as a regular denier - and readers probably interpret his comment to mean that extreme weather is no longer unusual (without pausing to reflect on what that means). Duncan doesn't want any talk of weather at WUWT. Extreme weather is for "alarmists". Clearly Anthony Watts agrees or he'd write about it. It does make WUWT very dull though, doesn't it. Personally I think weather stories like this “record busting snow” are just playing into the warmists narative of “extreme weather” and should be avoided here on WUWT. There is nothing abnormal about a lot of snow in Montreal and leave it at that. Russell is sick and tired of reading about climate change, so he spends time at "the world's most viewed climate website" knowing he'll just get climate change denial instead. Duncan I get so upset hour after hour all the propaganda Radio CBC, CTV, Weather channel and on and on Climate Change this and Climate Change that. I use WUWT as an outlet for my frustration. Please allow me to rant. You can use the search bar up top if you want more. I think you missed out the best bit: when our Brandon sticks his stick into the hornet's nest and gives it a good stir. And it gets even more fun when Toneb backs him up. Thanks for the mention folks (I'm Toneb). Best you stop stop flying then – because as we know here, all forecasts are wrong whether the GCM kind or the NWP kind. I keep giving too much benefit of the doubt to the denizens that’s my trouble. Hey – do you think they are falsifying FL winds? And maybe there’s a whole world-wide scam to cheat us out of our tax dollars by inflating the cost of airline tickets, coz really they are less and it takes more fuel to get anywhere. Also a classic attack from Stealey re fiddling of ice data graphs after I pointed out that "Rick's" graph showing current Arctic ice to be 10th lowest was one that had a "coastal mask" on and the graph that was linked below that one (on DMI site) showed it was actually currently ~3rd lowest. Look at the elaborate graph drawing and an animated Gif ... showing F*** all difference. Stealey's "if it's adjusted, it's no longer data" line killed me. Has he not read Watts et al. (2015) like the rest of us have not? I thought he was part of the inner circle ... but even the poster says that they do an adjustment for stations which switched from CRS to MMTS. The Onion is a satire website based here in the US that writes pieces meant to look like actual news stories, but which become completely farcical after about the first few paragraphs. They got their start before the Internet was a big thing, and actually used to publish on newsprint. I live in Ottawa, a two hour drive to Montreal. We had a heavy snowfall as well, but it should be noted that the temperatures on the days following the record breaking high on the 24th generally remained above the seasonal averages. Toronto, Montreal and Ottawa (Canada's largest, second largest and capital cities) each had their warmest December in the 130 to 175 years that records have been kept, breaking the previous mean temperature records (all set in December 2001) by the large margins of 0.9, 1.5 and 1.9 °C respectively. One thing to keep in mind is that despite Canada's size these cities all lie within 500 km of each other -- the close Australian analogy would be Melbourne, Canberra and Sydney. As for WUWT and its abject failure to note any of the climate-related weather disasters/occurrences affecting the U.S., that is a direct reflection on the fundamental intellectual dishonesty of that site and most of its readers. Similar articles could probably be written about many other countries from South America to east Asia, including much of Europe. Correction to the first paragraph: the margins by which the 2015 temperature records for Toronto, Montreal and Ottawa were set are +2.4, +2.1 and +2.7 °C (mean difference between the daily mean temperatures over the month at the cities' main meteorological stations). Do you have a link for those numbers? A friend was dubious that it was record-breaking, and assumed we just had faulty memories after last winter's record-breaking cold. @numberobis: I looked it up through Environment Canada's weather and climate site, which isn't the easiest to navigate around, with different data sets and times accessible through different menus. None of these are in particularly easy to import formats, unfortunately. My impression is that the Canadian government or this department hasn't made accessing this data much of a priority. On the other hand, I've also found UK data hard to get locate, haven't looked too much for Australian data, and haven't tried much for non-English speaking countries. U.S. data seems to be the best in terms of locating and downloading usable time series. Maybe someone who works regularly with data from a particular country learns all the tricks to finding where things are hidden. Nick Stokes at Moyhu is one person who has a lot of expertise in finding data. I've had trouble trying to navigate Environment Canada's website. Australia's BoM is a bit fiddly, but you can get (and download as csv or txt files) long term data and Acorn-Sat data from there as well as average trend maps and timeseries on a national and regional basis. "the Canadian government or this department hasn't made accessing this data much of a priority." "Sarcasm only works if it's grounded in fact." ... this post is a laugh about the overexcitement and biased reporting of alarmists, when presented with a little warm weather. That snowfall rescued my New Year's plans at the 11th hour: my family and my SO's family have met and are enjoying the snow together. It did mean we were several hours delayed, and driving through snow, to get to the cabin (and my half of the family waited for the next day), but being stuck in the woods with no skiing or snowshoeing would have been disastrous. Most people suffering from climate denial seem to fall into the trap of thinking deeper snow means it's colder. In fact somewhere that tends to be very cold in winter (say -15C) that as a result of climate change warms to an average of -10C, could well find snow levels increasing. It's also the case that snow that falls nearer to zero tends to be fluffier and therefore could end up forming a deeper covering. What this sums up as is that a warmer world can have places where snowfall actually increases--especially as warmer air holds more water with which to create the snow. In fact we can say that any weather record set today is likely to be as a result, in part, of climate change, for any natural event that occurs (the El Nino, for example) is happening in a world with, on average, 120ppm additional atmospheric Co2, 1C higher temps and 6% more moisture. Indeed, one thing that struck me as odd about the snowstorm was that it was -10 to -8 outside, whereas normally the big storms are near freezing. This morning it was -20C in Montreal; has Worall declared global warming to be over again?